At Pebble Paving Company, we take concrete resurfacing seriously. Choosing to cover your concrete for your home or business can sometimes be an overwhelming experience. We take pride in providing all of the information you need to make an educated choice when selecting beautiful durable pebble paving. Take a moment to review the following terms and then view each page for more detail. When you’re ready, call us at 858-292-9164 for a free in-home estimate and concrete resurfacing design consultation. Our list of Pebble Paving terms is alphabetized by category and sub-category. We’ll be happy to answer any questions you have about the best pebble deck and epoxy flooring for your home or office. Our Pebble Paving is known as Chattahoochee in the South. Chattahoochee also has a beautiful meaning. It is a Creek Indian word meaning river of painted rocks. 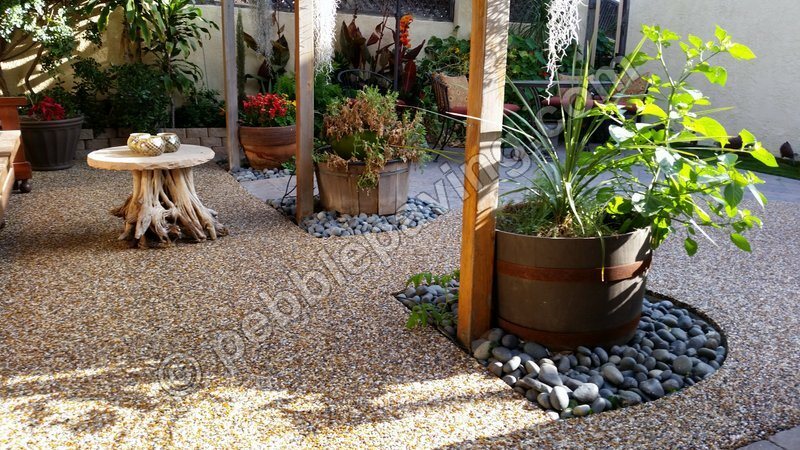 New, old or ugly concrete is the perfect base for Pebble Paving. 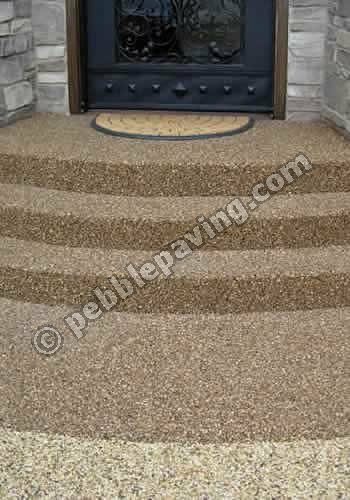 Replacing your concrete is not necessary with Pebble Paving. See beautiful examples of Before & After concrete covered with pebbles. 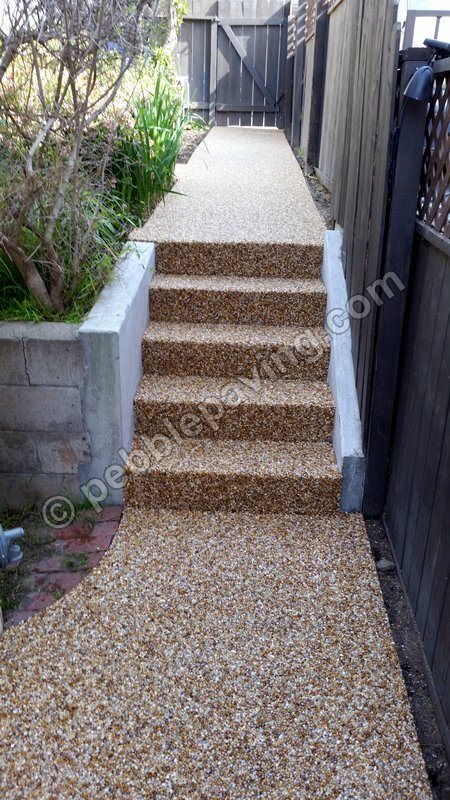 Use Pebble Paving to cover concrete areas around your home or business place. Below is a list of the most popular areas for resurfacing projects. Resurfacing an already existing patio is becoming a popular option for backyard transformations. If your patio is fairly sound, meaning hard surface, new or old concrete, ugly uneven cracks, then your surface is a good candidate for a pebble paving overlay. Our product can be applied in various thicknesses to create a new, smooth surface for your patio and is ready to use the very next day. Does your home have Curb Appeal? Your driveway and entry are the first things people see when they arrive at your home. Are they seeing a tired, stained and/or cracked drive and entryway? Time to dress it up with our decorative Pebble Paving! Get the look of natural stone without the hassle and expense of removing the concrete. Our product goes right over your existing concrete surface. 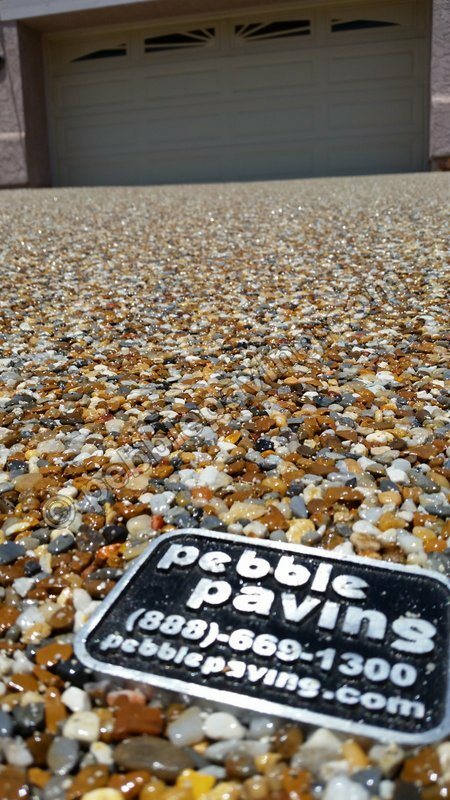 Pebble Paving is approximately 1/2 of an inch, stands up to vehicular traffic and is easy to clean. Our Pebble Paving surface will insure long-lasting beauty, durability, low maintenance and comes with a 10-year warranty. Contact Us today to schedule a free estimate. An unsealed, stained and cracked garage floor is an eye sore. Transform your garage into the visually appealing space it has the potential to be. 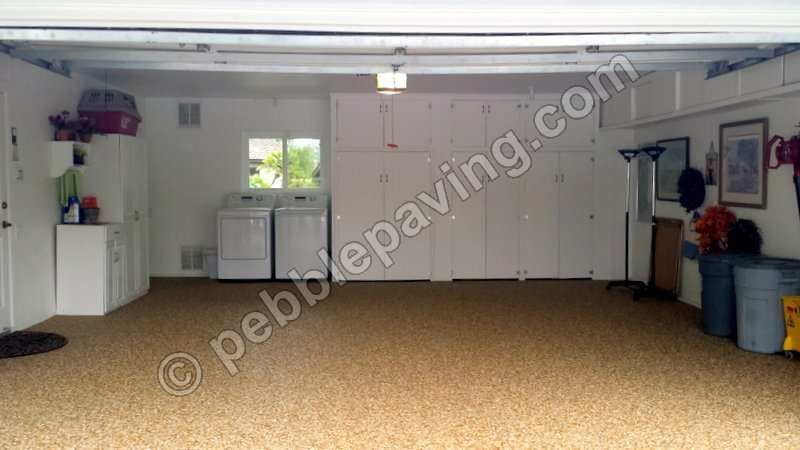 Be the envy of the neighborhood with a beautiful pebble paving garage floor. Our customers are pleased with their garage floor resurfacing and the many compliments they receive. Tired of your boring pool deck? Resurfacing can spice up your old pool deck without the hassle of tearing out the old concrete and pouring new. Resurfacing your pool deck with our pebble paving can help you add color using natural stone, the possibilities are endless. Resurfacing with a pebble paving overlay is a cost-effective option for adding a decorative touch to an existing concrete walkway while covering up minor flaws and discoloration. Once your new pebble paving is installed, you’ll need to learn how to maintain and clean the pebbles to make it last. The premium epoxy is a 2-part aliphatic amine epoxy. Epoxy, also known in the stone industry as A-B, consists of two parts. Part A is a resin and part B is a hardener. Our epoxy stone formula resurfaces your area in one day. For many, the use of epoxy stone flooring is a means for hiding flooring flaws but it can also be simple because of the beauty it offers. Epoxy is also known as epoxy resin flooring. The product is installed by covering the existing floor with it. This allows for the ability to completely hide the underlying floor. 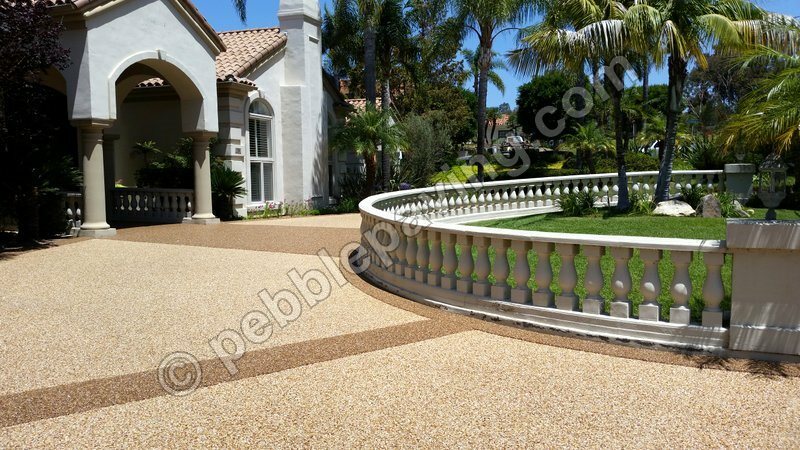 We only do Pebble Paving and have been serving San Diego and Southern California customers for over 30 years. Our paving goes right over your existing concrete. Check out our Fan Page for some recent pebble paving jobs. We use only natural pebbles in making pebble paving. We have many colors to choose from, see our product page for more colors and pebble samples. Our pebble deck and epoxy flooring is the best on the market. Its the perfect alternative to concrete replacement, allowing for resurfacing damaged or uneven concrete. Because it is accommodating to temperature change and minor ground movement, it is ideal for many indoor or outdoor residential or commercial applications. 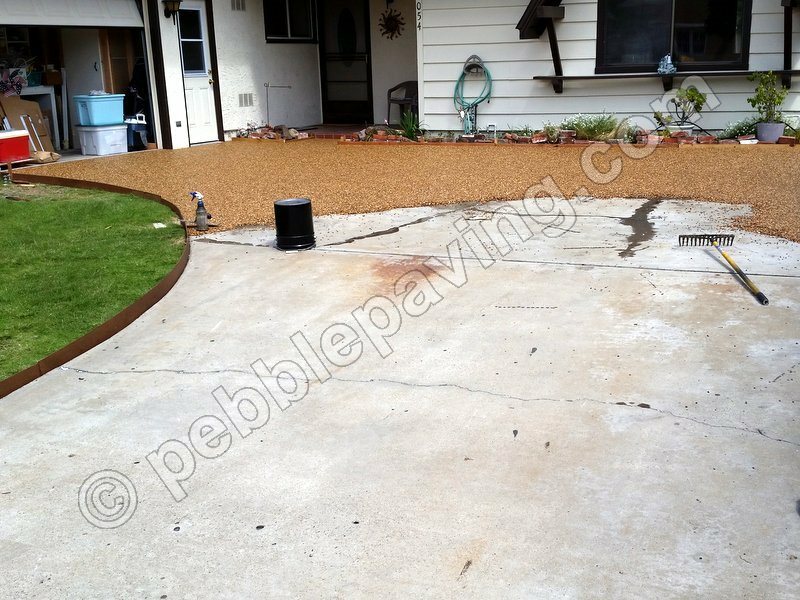 Resurfacing your concrete or hard surface with Pebble Paving saves days in prep and use. Learn more facts and why Pebbles are a proven solution for resurfacing concrete. Our pebble paving river rock is known as Silica pebble and mostly comes from the South. Several size ranges are available, applications include loose decorative gravel and decorative driveways and pool decks where it is embedded in epoxy resin over concrete. Stone and epoxy flooring is a good option for covering a damaged floor, for replacing an existing floor, and as a new floor. Our natural stone Pebble Paving system resurfaces your areas in one day.